Only The Glass Divides You From The Ganga River! The 21st Century Property of Neemrana Hotels! Private Holy Dips at The Glasshouse on The Ganges - 21st Century, Rishikesh! The Glasshouse on the Ganges honours an extraordinary geographical site where the Ganga turns around and flows north towards its source. This resort in Rishikesh is a magical natural spot and one of the most peaceful hotels in Uttarakhand. Set in a lychee and mango orchard of the Maharajas of Tehri Garhwal, with a garden of tropical plants, full of rare birds and butterflies, it has a sandy beach of its own, unlike the other Rishikesh hotels. 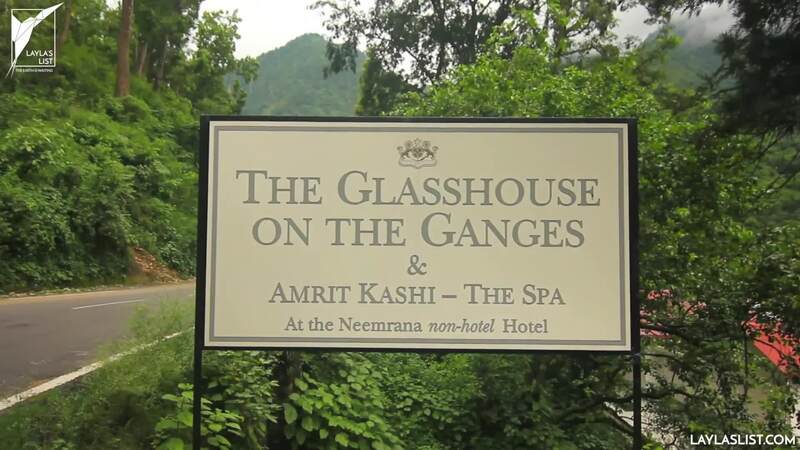 Your search for peaceful hotels in Uttarakhand ends at The Glasshouse on the Ganges. This resort in Rishikesh offers the unique opportunity to raft spiritual on India’s holiest waters! One stay here will get you started on the discovery of the most unique hotels in Rishikesh and the Neemrana brand in India! After the maddening hustle of the crowds which throng the daily dip or the Kumbh Mela, there is no better haven of calm anywhere in the vicinity of Rishikesh. It is known for its serene and spiritual atmosphere. You can easily commute between the Glasshouse and the crowded pilgrimage spots without feeling the strain of its fascinating but continuous oppression of numbers–the calmest bank to watch the Kumbh! You can enjoy an evening Arti at the Parmarth Niketan Ashram. You could also visit the Ram Jhula and the Lakshman Jhula.